Having achieved remarkable clinical success of regeneration of the skin and underlying tissues, MEBO has further developed a series of products (Figure 8.1.1a) and technologies for restoring normal structure and function to the skin that has been compromised due to aging. The products are topical agents containing the MEBO regenerative nutrients in isotonic formulations for ready absorption by the skin. To accelerate the regeneration and maximize delivery of the nutrients to the skin and underlying tissues, the products were delivered directly to the skin by using moderately pressured oxygen (Figure 8.1.1b). Such non-invasive procedure is conducted in a setting of medical spa inside MEBO’s Beijing headquarters over the course of 3 months. The results from our studies are surprisingly encouraging. 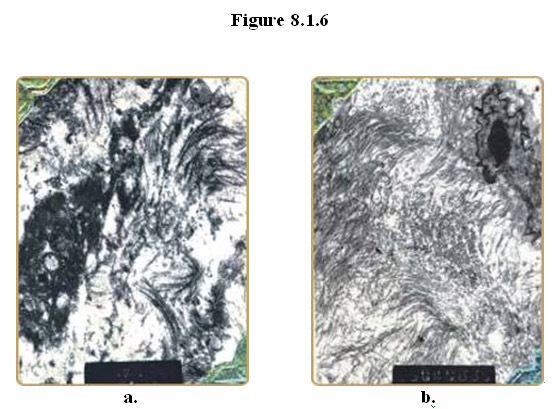 As shown in Figure 8.1.2 below, the skin of aged adult humans (age >50) can not only be renewed but also be restoratedd, i.e., reversed to a more youthful state. ii) The dermis and underlying tissue: loose, collapsed tissue, manifest more squared facial structure due to lack of support of the skin, and lack of suppleness and vitality. ii) The dermis and underlying tissue: supple, full dermis and underlying tissue tightening and supporting the facial structure to adopt a fuller, oval shape, radiant complexion. These results indicate that her skin has been restorated to have the structure and function of the skin of a person at least 20 years younger. In the same woman, significant results were also obtained in the restoration of the skin and underlying tissue of her neck. As shown Figure 8.1.3a below, before the treatment, the skin of her neck manifested the signs of aging, more typical of the skin of a person in the 60’s or 70’s: rough, bumpy, lusterless surface, severely loose, thinning dermis, showing of deep layer blood vessels, and lack of vitality. 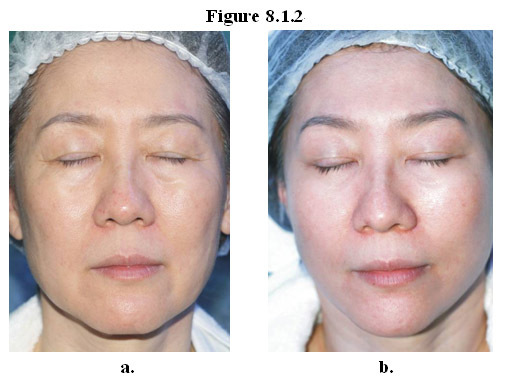 After 3 months of treatment (Figure 8.1.3b), consistent with the results of her face, the skin and underlying tissue of her neck have been completed changed: smooth, radiant surface, thickening of the epidermis, supple, fuller dermis, shallow necklines, tightening of the skin, and no showing of deep layer blood vessels, and full of vitality. The same technique has been used to restore the skin of an elderly man. 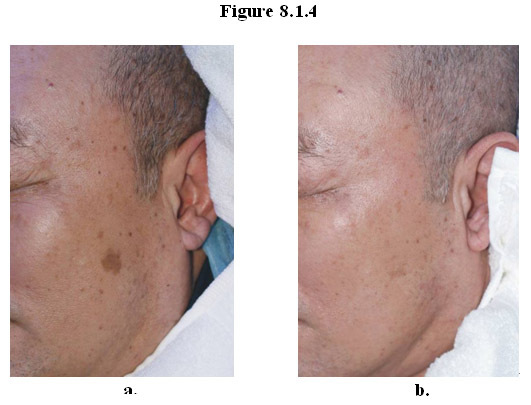 As shown Figure 8.1.4a below, before the treatment his skin showed typical signs of aging: hyper-pigmentation, numerous dark age spots, loose skin, and lack of vitality. After 3 months of treatment (Figure 8.1.4b), the condition of his skin was significantly changed with substantial elimination of age spots, reduction in hyperpigmentation, improved complexion and vitality. Looking beyond the skin surface, in the dermis of young skin collagen fibers form tight, orderly (Figure 8.1.4b) bundles whereas in collagen fibril bundles in the aged skin are much looser and more disorganized (Figure 8.1.4a). Examination of the skin sample under a scanning electron microscope revealed that delivery of the MEBO regenerative nutrients directly to the aged skin and underlying tissue results in regeneration of fibrocytes and restoration of normal, more youthful architecture of collagen fibrils. As shown in Figures 8.1.5a and 8.1.6a, typical aged skin has loose collagen fibrils arranged in a disorderly and chaotic configuration and shows signs of collagen dissolution and cytolysis of fibrocytes. After topically delivery of the MEBO regenerative nutrients to the skin, uniformly thick collagen fibers arranged orderly in dense, tight bundles parallel to the skin surface (Figures 8.1.5b and 8.1.6b).